Lenovo and Disney's Star Wars: Jedi Challenges is a fun way of getting into a galaxy far, far away. You can battle foes like Darth Maul with lightsabers and even play holochess. But now, Disney and Lenovo are adding a whole new flavor, just in time for Star Wars Day. Jedi Challenges is getting a multiplayer mode, which Disney says was the most requested feature when the original package rolled out last year. 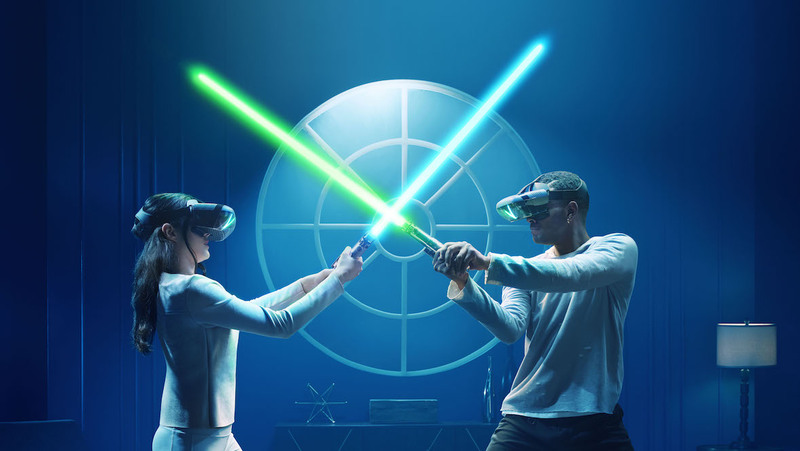 If you've got two Mirage AR headsets with Jedi Challenges (yes, you need two lightsabers as well), you and a friend can battle each other with your lightsabers in Lightsaber Versus Mode. You can't exactly go at it full force though. Disney tells Wareable that it wanted to avoid people standing there and waving the lightsabers willy nilly. They wanted the fights to look good, so they choreograph them in AR. You'll get prompts for when and where to block and attack, and as the battle proceeds the prompts arrive faster. The person who matches the prompts the most wins. We were able to go hands-on with the new multiplayer mode and it is certainly set to be a dream come true for Star Wars fans. While things seem to be easy at first, the quickening pace makes things very difficult very quickly. You'll not only have to match prompts, but you'll have to dodge and duck to avoid your opponent. You'll even get force powers that you can wield to make your battle easier (or harder for your opponent). It's a great time, and a good example of how much fun augmented reality can be in sessions of social interaction. So, could it be possible for Star Wars fans to design their own choreographed lightsaber battles to upload to Jedi Challenges? When asked, Disney was certainly open to the idea, but didn't commit one way or another. Lightsaber Versus Mode is a free update available now in the Star Wars: Jedi Challenges app. Once you've downloaded it and got your Mirages together, you're good to go.